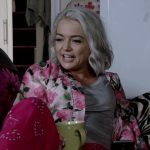 Hannah returned to EastEnders last night for a second stint as Karen Taylor’s sister Kandice, who found herself in a peculiar trouble involving mountains and fear of heights. She will also appear in other episodes this week: tonight, on Thursday and on Friday (17th, 19th and 20th). See screen captures in the gallery!